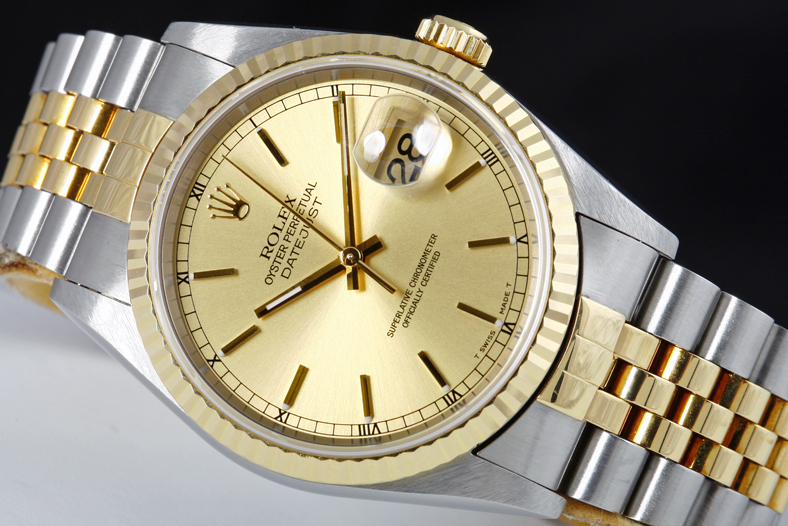 The Rolex Datejust was introduced in 1945 and appeared very similar to the Rolex Bubbleback. This was also the same year of the 40 year anniversary of the Rolex company. The Datejust was introduced as the world's first pressure-proof, self-winding calendar wrist chronometer which automatically changed the date in its dial window. The key differences in the Datejust was the introduction of the date function at the three o’clock position and is slightly thicker than the Bubbleback to accommodate the date wheel, which contained alternating red and black date markers to distinguish between odd and even days. It was fitted with a coin-edged bezel and a "pie-pan" dial. This coin edged bezel was later evolved into what is now known as the "Rolex Fluted Bezel". The cyclops feature, a magnified two and one half power lens (window) to allow easy visibility of the date, was first released on the Datejust. Rolex also introduced the Thunderbird version of the Datejust, where the only large difference between the two is the bezel: the Thunderbird model uses the Rolex Turn-O-Graph bezel. The Rolex Datejust remained the premier model in the Rolex line of watches until 1956. At this time, Rolex introduced the Day-Date President as its premium model. In the 1970s, there were four key features that were updated to significantly change the shape of the Datejust from its original design. A new 3135 movement was built to accommodate the quick-set feature and because of this, the Datejust had a smaller profile, a new case, and new dial design. A sapphire crystal soon replaced the plastic acrylic crystal, helping to secure the Datejust as the classic face of the franchise it is today. Over 50 years after the datejust was intoduced it remains a highly sought after model in the Oyster Collection, and is available in a large variety of designs and sizes. To see photos, compare, and view prices of the largest Rolex Datejust collection in the world visit our Rolex Datejust page. 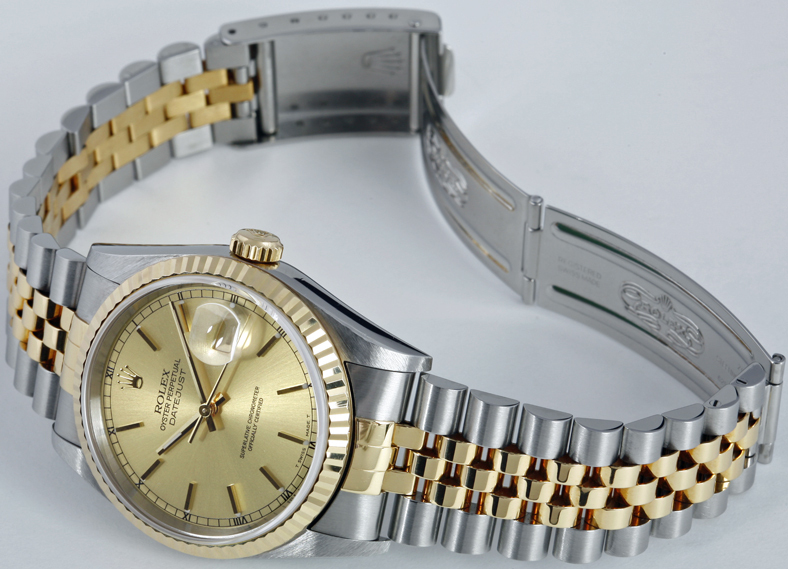 To see photos, compare, and view prices of the Lady Datejust, see our Rolex Lady Datejust page. Men's Rolex Datejust Two-Tone in Stainless Steel and Yellow Gold with the Jubilee Bracelet. The Rolex pictured has a Champagne Stick dial, also known as the face of the Rolex watch. It also shows the fluted bezel in Rolex gold. Men's Rolex Datejust Two-Tone with Champagne Dial. Shown with an Open Clasp on the Jubilee bracelet. This is a "no holes" model of the Rolex Datejust. Displaying one of the many options available, the Slate Diamond Dial with the new style set diamonds.